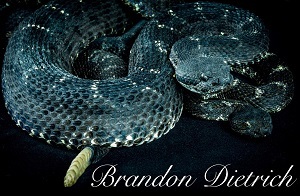 Crotalus cerberus is a medium to large rattlesnake with black blotches on a dark gray-brown to black background. Young have prominent brown blotches and facial markings on a light gray background. Coloration gradually darkens as the animal ages. The base of the tongue is purple. The neck is slender and the head is broad and triangular. On the end of the tail is a rattle composed of a series of loosely interlocking keratinous sections. A new section is added each time the snake sheds its skin. Crotalus Cerberus seem to do well in an enclosure such as the Exo-Terra Terrarium Large Wide enclosure while young. I prefer an enclosure of 1.22 x 0.6 x 0.4 meters (4 x 2 x 1.3 feet) (length x width x height) for an adult trio, or larger. This size enclosure allows for ample room for an adult trio to move, breed, and feed without complications. A well ventilated enclosure always seems to be best for every desert species of crotalus in my experience. It allows heat to escape from the basking area and allows to maintain a cool area that is needed to properly care for any crotalus species. I have used large neodesha hides for adults. I also use a steralite tub filled with a substrate mixture of coco fiber, sand, bark, and gravel. In this mixture I add roughly a table spoon of water crystals (depending on size of tub). I keep this steralite tub covered with the lid and a large hole drilled into the lid to allow access and exiting. These suitable tubs are always high in humidity at a cool section of the enclosure. This humid hide box is often used and enjoyed by them. In nature rattlesnakes hide in crack, burrows, and under rocks or logs. In these natural hides it is cool and typically higher levels of humidity then it is out in open forest, mountains, and even high desert. They utilize these natural hides an enjoy them. I want to provide something as close to what they prefer in nature. I do my best to give my captives options in temperatures, humidity and lighting. Bright warm dry areas with cooler moist covered areas. While I prefer a natural type enclosure for my captives they can be kept on Sani-Chips or other available reptile substrate that is sold in pet shops or feed stores. I use a mixture of coco fiber (eco earth -zoo med) and heat treated play sand from Home Improvement stores. I mix this mixture with a ratio of 1:1 or 1: 2 parts by volume (sand : coco fiber). I mix them in a bucket while adding water till the substrate is moist, not wet. I add this mixture to the enclosure and evenly spread it through out the cage at about 0.05 meters (0.16 feet) thick. I leave the area of the heat mat uncovered at this time. I then add cleaned rock or larger gravel spread over the heat pad area simulating a small, dry river bed. I then fill in the gaps of the rock with a layer of sand to close up the gaps and stabilize the rock. This also helps to hold them in place and allow heat transfer. This sand can be moistened with the heat mat OFF to prevent breaking the glass in the bottom of the enclosure. Wetting the sand lets the sand move and settle within the gaps holding the rock / gravel in place. The sand helps to evenly disperse the heat up through the rock and gravel allowing a nice gradient of heat for basking. Gravid females will use this area for extended periods to properly warm as they develop their live young inside of them. On top of the substrate mixture I will add an area covered with bark, leaf litter, or gravel. Usually making one end of the enclosure more forest with bark and leaf litter and the other end more rock and mountain scenery. Commercial top coats are available with brand names such as Forrest Floor and Repti Bark by Zoo Med. I add natural stone, logs, branches, and decorative plants for them to hide in. Cerberus like to lay on wooden logs. I mention in the substrate section a little bit of how to set up the enclosure to prepare for an under cage heating pad. Use a heating pad that is roughly 1/4 the size of the enclosure. You can add a basking light of lower wattage to simulate a sun or photo period. DO NOT use both if temps rise to high. Heat WILL kill your rattlesnakes. A heating pad will produce plenty of warmth alone to keep them healthy and producing babies. If you live somewhere very cold this may require both or a larger heating pad. I personally live in desert region and heat isn’t an issue. A cool area is needed with this species. They come from mountains that reach freezing temps during winter. Some live at high elevations with cooler over all temps but the majority are commonly found between 4500 feet to 5500 feet / 1370 meters to 1675 meters in the sky islands of Arizona. My reptile room is cooled typically to 24 – 25 °C (76 -78 °F) and enclosures kept at 27 °C (82 °F) air temp with the under cage heating element controlling the overall temp inside the enclosure. I use a thermostat such as Helix or Herpstat. I prefer a thermostat with night drop. Only keeping a stable temp for 2 months for a visibly gravid female. Heat is an issue here and keeping an enclosure cool is the hardest part. Heat is also an easy way to overly stress your captive animal. In their natural habitat it gets cool at night, even in summer. Crotalus species avoid the heat in nature. When temps are high in the desert animals become nocturnal to avoid the extreme heat. This shows that excessively hot temps are NOT needed. I suggest using a UV lighting source. I am currently using babies from the same litter and caring for one pair under UV and one pair without. It has been mentioned that UV lighting may be the cause of the lack in the development of the dark black coloration (melanin) in this species. I don’t see a reason not to add it. Many captive cerberus show a visible difference when captive bred even from the same locality. The majority seem to be lighter, bright whites, and more yellow coloration then you typically see in wild specimen. I have always used UV on mine so this is purely an assumption at this point. I use a photo period of 12 hours on and 12 hours off during summer time. After a dark, dormant brumation period you can slowly ease them into this lengthy day lighting cycle and ease them out in the same manner reducing the time by roughly an hour at the beginning and end of the light cycle each week. I keep a large clean water dish in every enclosure. I use ethical stoneware 0.2 meters (0.65 feet) crock dog dishes in the adult enclosure and 0.07-0.10 meters (0.22-0.33 feet) crock bowls in baby / juvenile enclosures. They are heavy and are unlikely to be turned over, dumped, or moved far. They are easy to clean and replace. If calcium or mineral residue / build up occurs you can use a soft stone and abrasive cleaner such as comet or ajax and remove this. We have hard water and this does tend to happen here if purified water isn’t available. ALWAYS provide fresh clean water. Remove any water that has been contaminated by substrate, feces, or other unsanitary material. Humidity is controlled by adding water to the substrate when needed. NEVER saturate the substrate. I use natural rock inside my enclosures which help keep areas more moist and cool then other areas of the enclosure. I also use water crystals to absorb excess water, prevent saturation, and allow for the release of water more efficiently and gradual in an attempt to keep humidity at certain levels for a specified period of time. In the wild Crotalus cerberus become very active during monsoon seasons. The males roam the foothills and higher elevations. Females usually stay close to dens and are rarely found to far away from them. When I want to breed cerberus I rise the humidity in the cage. This is also why I like a natural substrate and a heating pad covered by sand and rock. I add water allowing it to absorb but never saturate the substrate. The artificial river bed warms water and moisture creating a warm and humid enclosure. This simulates the warm monsoon rains in Arizona. After I moisten the substrate or even add new moist substrate I often see the male immediately start to court the female and begin to mate. The key to breeding cerberus is moisture and simulated rains of monsoon season. While they will breed and court without it. It does in fact stimulate them to breed. If you have a difficult time achieving this… Follow these steps I mentioned to encourage them to breed. The water crystals can be added to the substrate mixture as it is placed into the enclosure. Sparkle the crystals evenly through the mixture to prevent wet areas. I will add more about Humidity in the hide box section. Cerberus can eat mice that are proportionate to the size of the snake. Multiple smaller meals are always better then single large meals. 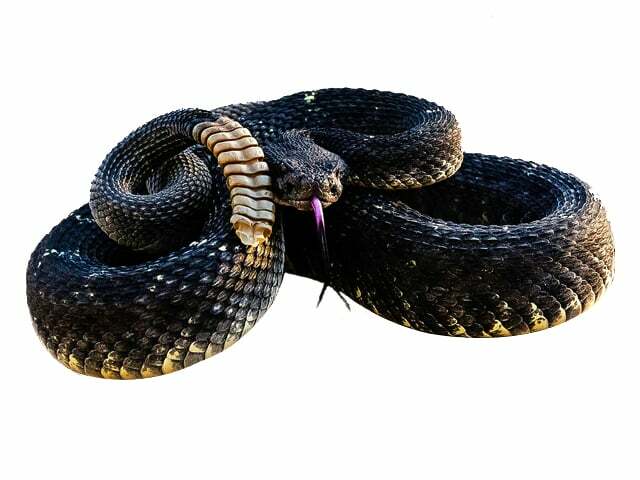 Cerberus tend to be smaller snakes but there are some that get very large and can easily eat a medium sized rat. This is the largest food item I offer to any captive cerberus. They will eat small birds and lizards in the wild. I only offer well fed mice or rats that are Frozen then Thawed. I do not want to introduce any wild food or even food from pet shops that may not have the high standards I prefer to keep. Wild food, filthy pet shops, and live food can introduce many things into an enclosure, No responsible keeper wants to subject their animals to the unnecessary and unhealthy threats. Live mice or rats can be fed to individuals that are fussy eaters or need to get a jump start eating again after wintering / brumation. Always watch live mice with your captive. Never leave the mouse in the cage for extended periods of time. Live mice or rats can injure and kill your animal if they are left in an enclosure with a snake that refuses to eat them in a timely manner. Cerberus are a very intelligent species often showing signs of interest and curiosity. They will often come to the glass just to watch you work within the snake room. My females show the most interest in humans. They always come crawling out and looking around as after I open the enclosure. They will crawl around and look around with a curious interest in what is going on outside. Males tend to be more reserved at the back of the enclosure during this time.The male will just watch in comparison to the female, possibly coming out to see what is going on after the females lead. Males do tend to be larger then the females also. Males are typically more active in the enclosure just as they are in nature. With understanding your animals and being a responsible venomous keeper I personally use a 1 meter (3.3 feet) snake hook and a shift box or bucket with lid. I use the 1 meter snake hook, a 5 gallon bucket with a “gamma seal” screw down lid for holding during cage cleaning and transfer within the snake room. I drill vent holes in this bucket large enough for fresh air to pass through but also small enough to prevent escape. I do not handle my snakes unless absolutely needed. Venomous snakes need to be treated with respect and left alone except for cage cleanings, feeding, and transfer into other enclosures. Remember, the more you “handle” your venomous animal… the more that you cause it stress. There is no need to add any additional stress to your captive animals. Other then the added stress to your animals you are adding risk of a potential accident or mishap that could result in a bite / envenomation. As responsible venomous keepers it is our job to show that we are professional and responsible keepers. Every bite, risky behavior, or bad handling practices effects all of us in this hobby. Free Handling is not smart, it is not cool, it is not exciting, and it is not impressive to anyone that keeps these animals. It only makes you look very bad and inexperienced to the mature and experienced reptile keepers. It also makes you a target for negative remarks, loss of respect, and you also become an example for law makers and citizens to pass laws against the private ownership of these magnificent animals. PLEASE: keep a locked, safe, escape free enclosure. DO NOT excessively handle your animals other then when absolutely needed. DO NOT post photos of irresponsible acts. It is ultimately us as an entire hobby that will suffer for every single mistake a person makes. One person makes hundreds look horrible, irresponsible, and just careless. I use a mild bleach and water solution on all cage material when I remove and replace the substrate. After washing all decorative cage material I soak them in this water bleach solution. Then clean them again rinsing any harmful cleaning agents from them! I allow them to sun dry and will not put them back into an enclosure if I can smell ANY bleach on them. If you do smell bleach, wash them again and allow to sun dry. I clean out the substrate with a hand broom and dust pan. Emptying them substrate into a trash bag and can. Then clean them as clean as possible with warm water and Dawn dish soap. I use a spray bottle containing a mixture of bleach and water to spray the cage and allow it to sit for more then ten minutes. Then wash again with a different bucket of clean warm water and light dawn dish soap again. Then one more wipe down with just pure warm water. I then add the substrate. I moisten a paper towel with Glass cleaner and clean and glass or viewing areas. I DO NOT spray glass cleaner into a cage after substrate or decorations are in place. I just moisten a new paper towel and wipe where needed. No cleaner show be allowed to soak into cage substrate of decorations. As they grow shedding is typically done evenly and without difficulties. I personally have never had a stuck shed, persistent eye cap, or any other troublesome problems involved with this process. They do tend to change to a blue haze color and can be seen in the basking area and humid hide box more often then usual during the time before they shed. I personally have never experienced any form of health issues with this species. They can become fussy eaters at times though. Other then that, captive bred animals are great captives that will do very well and hopefully live very long lives when properly cared for.